When Margaret Williamson left her family’s rural Wisconsin farm to work in Minneapolis in 1923, her mother, Olava, wrote regularly with updates about daily activities: laundry, bread baking, plowing, planting, and harvesting the crops. Sometimes she enclosed a note from seven- year- old Helen, who reported on school and shenanigans and how she longed to see Margaret again. So begins decades of stories about a family at once singular— with personal joys and challenges— and broadly representative of the countless small farms that dotted the midwestern landscape in the early twentieth century. As Margaret’s niece Sara DeLuca weaves together family tales gleaned from letters and conversations, we learn of births and deaths, of innovations like the automobile, radio, and telephone that drew rural communities together, and of national and international events that brought home stone- hard truths. Depression- era farmers struggled to keep their land and feed their livestock; many failed. During wartime, this family made do just like everyone else. The tale that emerges is one of fierce devotion to family and work, of a changing landscape as smaller farms became part of conglomerates, and of the comforting daily rhythms of life shared with those who know us best. Poet and writer Sara DeLuca grew up on a dairy and sheep farm near the Williamson “homeplace” in Polk County, Wisconsin. She is the author of the memoir Dancing the Cows Home and the poetry collection Shearing Time. 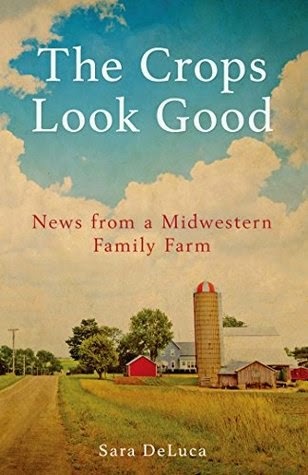 The Crops Look Good: News from a Midwestern Family Farm by Sara DeLuca is a very highly recommended biography of a family, told mainly through their correspondence, who lived on a dairy farm in Polk County, Wisconsin from 1923-1955. Although I understand that this biographical narrative will be appealing to a limited audience, those who chose to read it are going to be entranced and delighted with this chronicle of a past way of life. Polk County, Wisconsin is "dairy farming country, settled primarily by Scandinavian and German immigrants..... The soil that once nurtured hardwood forests is rich and loamy. But the climate is extreme and unforgiving, ranging from one hundred degrees in midsummer to minus thirty in the deep of winter." DeLuca was given the family letters she uses to tell the story of her families past over twenty years ago, but she waited until she felt ready to undertake the writing. She writes, "They were a burdensome gift. I had been given an assignment I could not fulfill. The farming culture described in these letters has passed into history. I wanted to bear witness to that time. But any book I might create from these writings would require skillful narration, and I did not feel up to the task." Once she felt ready to write this intimate biography, she decided to present the letters chronologically and added notes on historical details from each time period. She manages to capture a past way of life in a rich, rewarding way, with details that bear witness to the work ethic of the times. We are not getting any more strawberries now but we have been picking rasberrys for quite a while. Some of the rasberrys in the middle of the bushes are so ripe they are pretty near purple and they are so nice and big. Mama has canned 25 quarts of rasberrys and she has canned 12 quarts of peas. I milked 3 cows last night and washed all the supper and lunch dishes. They finished haying yesterday afternoon and soon they are going to cut the last field of peas. Mama is washing clothes today and I have to find my new stockings so she can wash them. Good-bye for now and love from sister Helen"
Disclosure: My Kindle edition was courtesy of Minnesota Historical Society Press for review purposes.